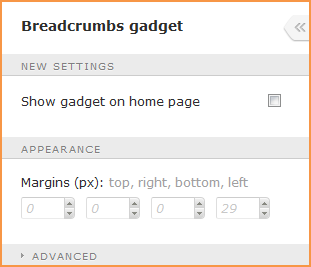 You can add properties to the breadcrumbs gadget to allow you to control additional aspects of its behavior while editing a page or page template. For example, you might want to add an option to hide the breadcrumbs gadget when on the home page. We'll create a new version of the gadget, preserving the original version, just in case. Under the /Gadgets folder within the downloaded theme files, create a BreadCrumbsAlternative folder. Copy all content from the /Gadgets/BreadCrumbs folder to the new /Gadgets/BreadCrumbsAlternative folder. Here, we define the ShowOnHome field and set its alignment, title, and the title's width. Here, we define ShowOnHome as boolean (it can be true or false and graphically represented by a checkbox), set its default value and initial value, and specify the width of its checkbox. Note we use the same names as in SettingsLayout.cfg. Next, we need to connect the setting to the gadget's HTML code. 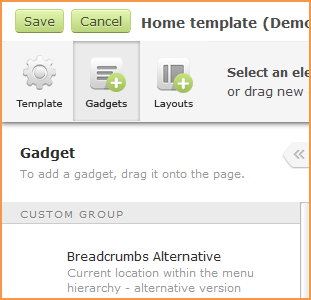 To do so, open GadgetTemplate.tpl within the Gadgets/BreadCrumbsAlternative folder for editing. Save the changes you have made to the GadgetTemplate.tpl file. Upload all new and modified files and folders to the appropriate folder under the Theme_Overrides folder on your site from the Files screen or using WebDAV.